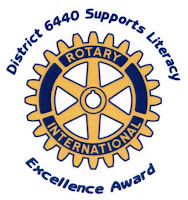 Winnetka-Northfield Rotary wins district literacy award! District 6440 Governor Mike Erikson announced at the Rotary District 6440 Conference that the Winnetka Northfield Rotary was one of the recipients of the District Literacy Committee's Excellence in the Promotion of Literacy Award for their numerous projects, including accessible literacy library projects which are growing beyond the local libraries toward national and international library participation. Accessible literacy projects allow all individuals, including those with disabilities, to read about their world and make it a better place. Award-winning Literacy Projects coming soon! The literacy committee of Rotary District 6440 just completed a video that featured some of the 2006-2007 award-winning literacy projects of the district's Rotary clubs. This video will be shown during the district's conference in Itasca, Illinois on April 25th. Check back here for a You-Tube video of these wonderful projects. On April 26th, the 2007-2008 award winners will be announced during the awards luncheon. Check back here for a list of the winners and the great projects.